It has been noticed recently that your performance is not on par with the acceptable level. This has been confirmed by the continuous complaints from your direct manager and your colleagues. You have been neglecting your duties either intentionally or unintentionally. You have fallen behind in many of the projects and tasks that were assigned to you. Despite the several verbal warnings, you did not show any signs of progress. In the light of what has been said above, we are forced to escalate the matter to the next level. Please consider this letter as an official written warning. We would have preferred not to reach this stage but we were out of choices. You are required to improve your performance and increase your productivity. You have done it before and we are confident that you can do it again. If there is a specific reason stopping you from performing at your best level, then please share it with us so that we understand the problem and work it out together. A reevaluation of your performance will be conducted within [two weeks] from now. We are looking forward to some dramatic improvements. 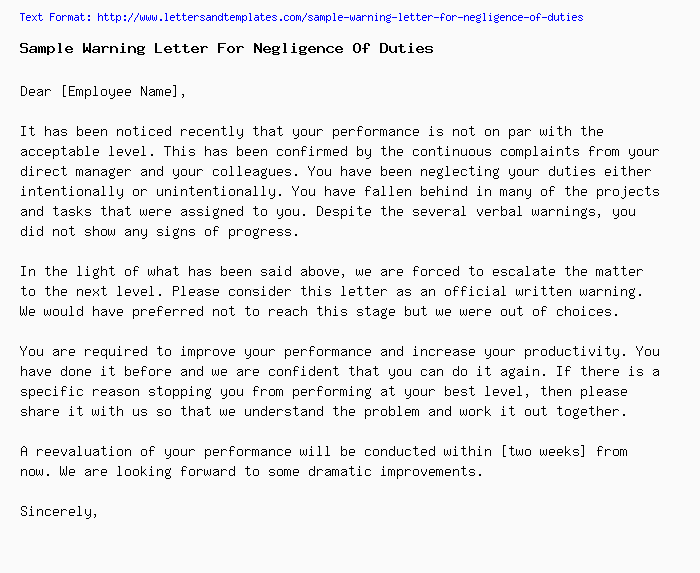 I am writing you this letter as a warning to the continuous and unexplained negligence of the tasks and duties assigned to you. Despite the many verbal warnings, you showed little to no progress when it comes to getting things done. You keep on delaying your tasks, missing deadlines, handing over uncompleted deliverables, and coming late to office without prior notice. I try to be as tolerating as possible with my team members when their circumstances change beyond their control, but I simply can’t tolerate deliberate negligence or intentional sluggish behavior. I want us to work together and get things done, so I am kindly asking you to consider a dramatic shift in your attitude and your perspective to your job. You are required to work on the points mentioned above and start accomplishing the tasks and duties assigned to you with success and without delay. We will be reassessing your situation four weeks from now. Looking forward to great progress.